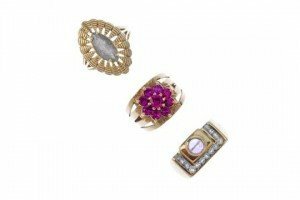 A selection of three gem-set dress rings. 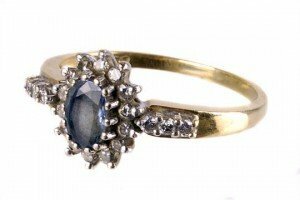 To include a 9ct gold labradorite single-stone ring, a synthetic ruby cluster ring and a 9ct gold amethyst and blue gem dress ring. 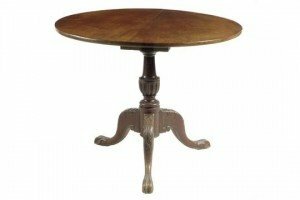 Two with hallmarks for 9ct gold. Total weight 16.2gms. A diamond and gem-set pendant mount. 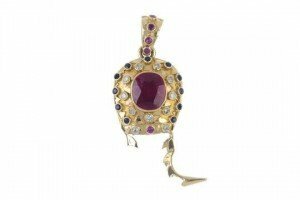 The cushion-shape ruby, within a brilliant-cut diamond, circular-shape sapphire and ruby raised collet double surround, suspended from a circular-shape ruby line surmount. Estimated total diamond weight 0.25ct. A 9ct gold diamond floral cluster ring. 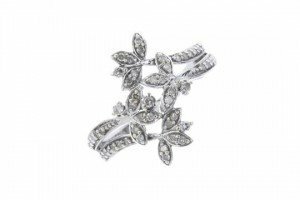 The single-cut diamond bifurcated sides, with similarly-cut diamond floral, asymmetric terminals. Total diamond weight 0.25ct. A pair of diamond ear pendants. 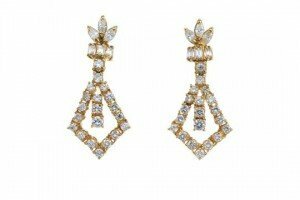 Each designed as a slightly graduated brilliant-cut diamond line, within a similarly-cut diamond kite-shape surround, suspended from a baguette and marquise-shape diamond surmount. Estimated total diamond weight 2.20cts. 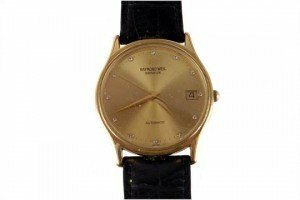 A Raymond Weil Automatic gentleman’s dress watch, having gold plated circular case with gilt dial set with clear stones and date window, on a black leather strap. 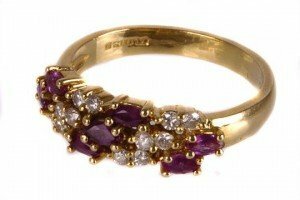 A sapphire and diamond ring, the central oval cut stone in a surround of brilliants, to brilliant set shoulders, the yellow gold shank finger size M.
A ruby and diamond half hoop ring, the three rows alternately set with a oval cut ruby and a pair of brilliants, mounted in 18ct yellow gold. 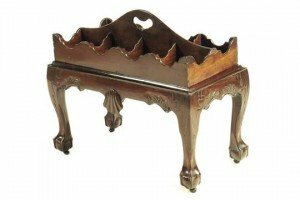 A mid 18th century Irish mahogany decanter-stand, the lift-off top with a pierced handgrip and eight divisions above a leaf carved frieze with an applied shell, on cabriole legs, claw and ball feet and leather roller castors. 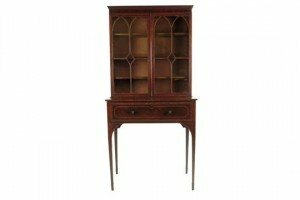 A George III Irish mahogany and satinwood banded secrétaire bookcase, with a pair of lancet astragal glazed doors, inlaid with stringing and kingwood banding, above a conforming base, the drawer fitted with a leatherette writing surface with an arrangement of pigeon holes and satinwood veneered drawers, on square tapering legs and spade feet. 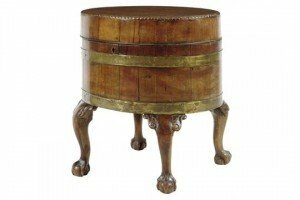 An early George III Irish mahogany tripod table, the circular tilt-top revolving on a birdcage, on a fluted baluster stem, on carved legs, two with a grotesque mask. 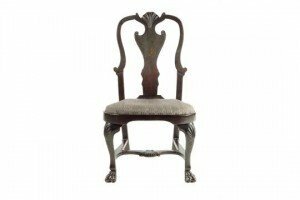 A George II Irish mahogany side chair, the top rail centred a shell above a vase shaped splat carved with leaves and florets, above a bell shaped drop-in seat on shell capped cabriole legs and paw feet united by wavy stretchers. 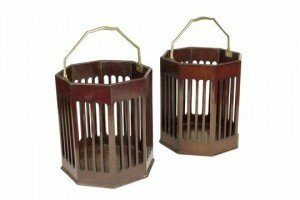 A pair of late 19th century Irish mahogany octagonal waste paper baskets, each with a brass swing handle, above a pierced slatted body. 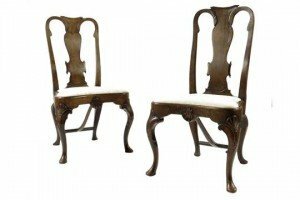 A pair of Queen Anne style walnut side chairs, each with a scroll top rail above a shaped solid splat inlaid with banding, above a drop-in seat, with a shell centred frieze and shell capped cabriole legs and pad feet. 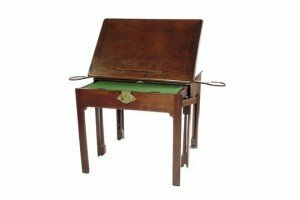 A George II mahogany architect’s table, the moulded edged hinged top on a ratchet with a rest on a hook and spring mechanism, above slide-out candle holders, the pull-out front with a baize lined surface revealing divisions, the right side with a hinged pen and ink compartment, the front with a brass plate handle and on quarter pilaster supports and brass roller castors. 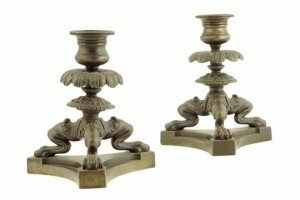 A pair of Regency bronze tripod candlesticks, each with a turned nozzle above lion’s paw monopodia supports and a triform base. 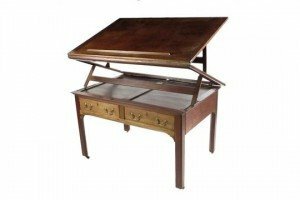 A George III mahogany architect’s table, the twin hinged top with a rest and on a double ratchet support, above two frieze drawers on moulded chamfered supports and brass castors. 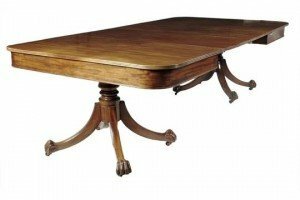 An early 19th century mahogany dining table, the reeded edge top with two additional leaves with pull-out supports, on turned stems to four splay legs terminating in carved paw feet and brass castors. 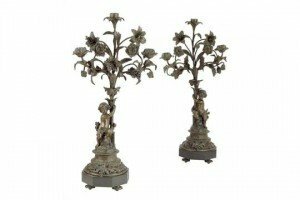 A pair of 19th century French bronze candelabra, each modelled with a putto seated on a classical plinth holding a flower, each with three lights on a black marble base and foliate feet. 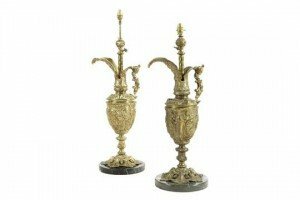 A pair of late 19th century ormolu ewer table lamps, each decorated with rocaille, leaves and cast with figures to the bodies, with female bust handles, on black marble bases.